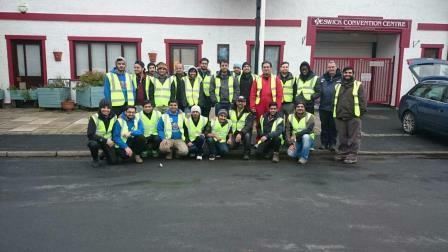 A group of young Muslims are travelling to and from Cumbria in order to lend a hand to local residents affected by the flooding.The youths, who are part of the Ahmadiyya Muslim Youth Association (AMYA), are distributing food and water, helping older residents move furniture, clear debris and providing moral support. The group is also contributing money to pay for essential equipment and supplies.Dr Aziz Hafiz is the director for disaster relief for UK charity Humanity First, which partners with AMYA to “assist wherever there is need irrespective of race, colour, creed or religion”. “There were up to 60 volunteers this weekend and they arrived in the early hours of the morning and returned home in the evening. Then they were back again the next day,” he told HuffPost UK.”The response from the locals has been truly amazing and touching. The gratitude has been very emotional, even though the volunteers work [freely] as it is an essential tenant of their faith to serve humanity for no reward.”The youths worked in several areas of Cumbria, including Cockermouth, Keswick and Braithwaite village – which were among the worst hit areas. Tens of thousands of people were left without power when record rainfall fell, and some homes are still yet to regain electricity. 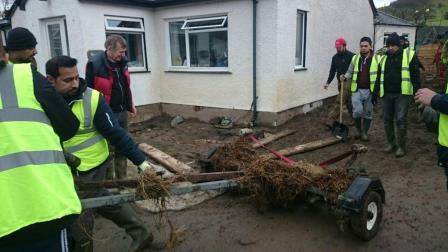 Share the post "Muslim Youths Are Taking Turns To Drive To Cumbria To Help Flood Victims"